Some people like Almost Famous because of its cleverness, honesty and truthfulness. But although there are some elements of these in the movie, Almost Famous is still not much different than the typical Hollywood feature. This does not prevent the film from being a good effort but it is hardly so close to reality as people try to describe it. There is drama, comedy, small twists and of course a happy ending... What else would you expect from a Hollywood movie? Almost Famous is undeniably a good movie. The story is interesting. William sees a lot of new things about life, love, drugs, betrayal, etc. and it is easy to like him. The direction is fine. The acting is quite strong. Kate Hudson makes a very nice performance as the famous groupie Penny Lane (though she and her colleagues prefer the term "Band Aide" instead of groupie). In this movie, Hudson is capable of bringing a sad smile to your face. Frances McDormand is wonderful as usually in her role of William's mother. You can easily feel the concern about her son and at the same time she is very funny in her attempts to protect him from all bad and evil. The actors playing band members (Billy Crudup, Jason Lee) as well as Patrick Fugit also make decent performances. And of course, we have Philip Seymour Hoffman who has a tiny portion of screen time but makes a memorable appearance as an honest, experienced and predictive rock journalist that readily helps the naive and enthusiastic William in his march towards the success. The director Cameron Crowe tries to present some of the nasty sides of being a rock musician or a person working/living in rock industry circles. And indeed, the movie manages to make it at times. 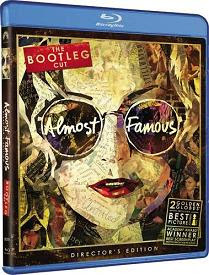 But somehow Almost Famous suffers from being a Hollywood film. There is a forced happy ending and there are several unbelievable events. Why a magazine would ask a rock star whether an unfavourable article about him is true? What answer do they expect? "Yes, we behave like stupid, immature bastards, go and publish it." There are a couple of other not feasible moments too but let's not spoil the whole movie. Despite its faults, Almost Famous is an interesting and entertaining picture to watch. Being a movie about music, it could be anticipated that the film would offer a good soundtrack too. And it does. Just do not expect that this is the definitive movie about the rock industry or about journalism. It's a motion picture after all thus it's a bit disconnected from reality. But if you don't insist on learning everything about the real doings of "almost famous" people from this source only and you enjoy movies about music, go ahead and watch the film. For more movie reviews explore the Review Maze.